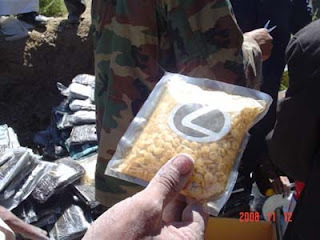 In 2008, over 27 tons of narcotics and 14 million pills were seized, and around 259 people were arrested for drug trafficking. 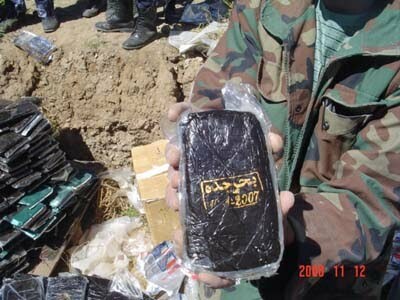 88 percent of those arrested were Yemeni, said a source at the Anti-Narcotics Directory at the Ministry of Interior. Recently, drug-related news has increasingly made the headlines in Yemeni media. A recent headline revealed that security authorities in the Aden Free-Zone port have prevented the importation of over 2.6 million narcotic tablets hidden in ovens being shipped from Egypt. Authorities said they seized 2,610,000 Keptagon pills in five bags. The drug problem is increasing in Yemen due to the length of the nearly 2,500 kilometer coast as well as the considerable length of the Yemeni desert bordering neighboring countries. Yemen used to only be a transit point for smuggling drugs from eastern Asia via the Arabian Sea to African and Gulf countries, but this is no longer the case. The recent confiscation of narcotic tablets, increased smuggling a variety of illegal drugs via the Indian Ocean into the southern Yemeni governorate of Hadramawt, and trials of several individuals accused of smuggling tons of drugs into the country are all explicit indicators of a real drug problem in the country. Surprisingly, the majority of Yemenis are in denial about the depth of the matter. "There is no such problem in Yemen. We don't have drugs or addicts. We may have a qat problem but it is not addictive, only energizing," said Amani, an elementary school teacher. This denial makes it difficult for society to comprehend the basic facts related to the subject. Drug addiction is widely considered a pathological state. It is defined by many as the use of an illegal substance such as marijuana or cocaine, which some people take in order to feel happy, relaxed, or excited. Consequently, the user wants more and more of it. Dr. Youmna Fathi Al-Aswadi, an addiction counselor, explained the major phases of using drugs. "The disorder of addiction involves stages which are characterized, respectively, everywhere by constant cravings and preoccupation with obtaining the substance, using more of the substance than necessary to experience the intoxicating effects, and experiencing tolerance, withdrawal symptoms, and decreased motivation for normal activities." Drug addicts come from all segments of society. Since drugs are of all costs (cheap and expensive), both the poor and the rich can afford them. Economic decline, social problems, poor friendships, Qat sessions, and ignorance are all factors that can take a toll on primarily the young. Consequently, drugs could be the answer. "I had to work for long hours. I got exhausted and really wanted a pick-me-up. I told my boss about this and he gave me an already opened bottle of milk several times. I drank it and felt really great. I slept little and worked tirelessly. Then I asked for more and he told me that pills were added to the milk. He charged me to get more of the pills," said a construction worker, clearly showing the signs of being an addict in a short period of time. Another drug addict explained how he initially used drugs. "I wanted comfort, so I went to a pharmacist friend that initially gave me the pills. I felt really good after taking them along with Qat. Then, gradually, I took other pills with greater effects. Finally, I used a needle to inject drugs. I needed the strongest effect because the pills didn't do much for me anymore." Frequent drug smuggling news, the frequent uncovering of drug operations by security efforts, and the desperate desire for drugs by addicts shows how this is a highly profitable industry. The more drug-related news, the more addicts exist, the more profit. So, it is an unquestionable matter that there is a drug problem that needs to be addressed. 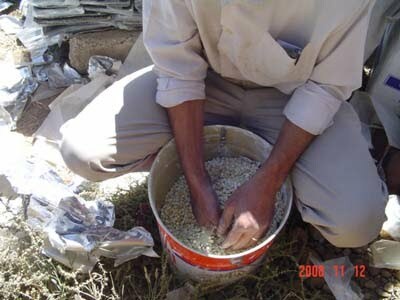 Yemen is well-known for Qat consumption. Qat sessions and smoking are the seeds of drug use. In most cases, Qat and smoking lead to harder drugs. According to one addict (who's married and has a 9 year-old son), a new trend in the Yemeni drug world is a combination of any energizing drink and pain killers, mostly consumed during Qat sessions. "I'm an addiction counselor and I've never met an addict who was not a smoker, a Qat chewer, or both," said Dr. Youmna. "Qat sets one onto the path of harder drugs. Most drug users have turned to drugs after first being smokers, Qat chewers, or both," said Ali Saleh Al-Makaleh, the Chief of a Drug Danger Awareness-Raising Team in the Future Guardians program of the Life Makers Foundation. Qat use, the search for comfort, and the figures of seized drugs are key elements for acknowledging the severity of the issue. However, lack of awareness makes it a great challenge to be open about the problem and establish suitable and urgent solutions. Al-Makaleh explained why, despite all of that, there is collective social denial about the subject. "Our society is utterly in denial because they're not following the news. We waste our time on following entertainment news on TV channels, newspapers, or magazines. We often neglect our local news which has caused a national lack of awareness. It's all out there in the media. Nothing is hidden. The drug news that makes headlines, the uncovering of more drug operations, and the statistics for seized drugs that appear periodically and are all out there to the public but no one is aware." "Enough negligence! The problem is everywhere in the country and it's spreading too fast. It's like a devastating flood that will destroy our country. We have to take action now before we lose more and more of our youth," he added. In the meantime, a great number of Yemeni youth are falling into the drug addiction trap. "I've been an addict for almost ten years and I'm really stuck. I’ve tried so many times to quit but I can’t. My whole body aches whenever I stop using the pills. I consumed lots of pills over the last ten years and it's really difficult for me to stop. I don't know where to turn to." added a drug addict, choking with tears. Regarding the appropriate treatment for addicts, Dr. Walid Sarhan, a Consultant Psychiatrist explained, "The drug addict is a sick person who needs treatment, while the abuser is a person who takes drugs on and off and can stop if they want to. The addict will have many withdrawal symptoms that could be serious or even fatal. That's why we need addiction centers for treatment, both for detoxification and rehabilitation. After treatment, the addict could lead a normal, productive life." Ashwaq Al-Malahi, an activist for combating drugs and an Executive Officer at Life Makers Union, explained the importance of having a treatment center for addicts. "Since awareness and an addiction treatment center can't be separated, we really need a place for rehabilitation. Once an addict who wants to be treated comes to us, we check him in. Just because you are an addict doesn't mean either you are going to jail or will die. We've got to have a decent rehabilitation program to help the addicts." "If addicts knew the laws concerning their condition, they would not hesitate even a bit to seek help. In our constitution, it's stated that if an addict admits to being addict and asks for help, he should get the help and not be jailed for drug use," a source at the Anti-Narcotics Directory at the Ministry of Interior said. Since drug addicts are socially considered to be criminals, it's very difficult to take the needed actions for treating them." Addicts are socially convicted criminals, so it was natural to have difficulties for establishing the treatment center," he added. The Life Makers Foundation is still coordinating a draft of the project with the Ministry of Health, Dubai Police, Yemeni businessmen, the UN, and NGOs. Each one would participate in different ways. "The Ministry of Health expressed monetary reservations, but completely agreed on the idea. To build such a place would cost heavily. We thought we could knock on businessmen's doors and ask for financial support, and they approved of supporting us financially but the amount of money they offered was too little. They explained that if they were to donate a large amount of money, they would like it to be for an investment program, rather than on drug addicts," he added. The Dubai Police have held several courses for the Antinarcotics Directory at the Ministry of Interior on Combating Drugs. On their last visit, Mr.Ibrahim M.J.Dabal, Lt. Colonel Expert at the Dubai Police said, "There has been a great exchange of information between us and Yemen regarding the combat of drugs and if there were be a treatment center, Yemen could count on us consulting-wise, since we have the expertise." "Many addicts come to us seeking help and it's really devastating when we have to tell them that there is no treatment center," added Al-Malahi. As long as there are drug activities, it is crucial to have a treatment center to provide adequate help. "The businessmen’s support is sorely needed, but until the project actually materializes, every promise of support we have is pointless. Our current concern is to enlighten the public about the drug problem, and to attract the required governmental attention. It is crucial to have the government fully involved and committed to the cause. Drug addiction is a disease and these addicts are sick, not criminals. 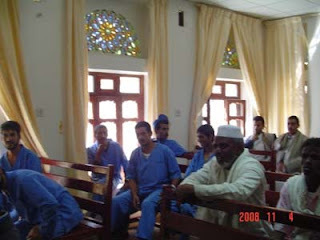 So, the rehabilitation project is a national project," added al-Washali. "No doubt every addict would love to recover and live a normal life just like everyone else. I look at my daughters and I'm afraid that one day they might get caught up in the drug world. No one is immune. If it won't happen to you, it could happen to your neighbor, to your cousin, to your siblings, to anyone," added Mr. al-Makaleh. Concerning the status of the treatment center, a source at the Ministry of Health said, "It's definitely on our long-term agenda, but not in the short-term." According to the UNODC (United Nations Office on Drugs and Crime) what really undermines the fight against drugs is the lack of awareness. The fight against drugs has been hampered by society's lack of knowledge. The society's full involvement is crucial to combating drugs. Security efforts for combating drugs are only 30% of the solution, while the rest of the responsibility falls upon society. "Having a treatment center for addicts is a national responsibility. We would love to have volunteers and donations from everyone. There is still hope and hopefully the center will be established very soon," expressed everyone who was interviewed. An addict’s advice to everyone is not to take the drug road at all. "I tell all of the young people to never use any kind of pills. Not even pain killers unless they are prescribed by a doctor," advised an addict. Dr. Sarhan expressed how governmental involvement and family support go hand in hand. "The main policy in dealing with the drug problem is prevention, whereby the supply of drugs is stopped by the police and customs officials, and the reduction in demand for drugs is done by the family, schools, religious leaders, and the media," he said.